It’s important to protect your digital privacy. There’s so much information about your life on your computer and you definitely don’t want those details in the hands of the wrong person. 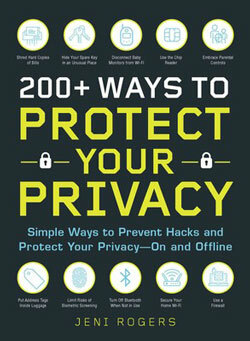 Jeni Rogers, author of 200+ WAYS TO PROTECT YOUR PRIVACY, shares her tips on being safe with your digital privacy. Online shopping and e-commerce have re-engineered how we shop and consume goods. We can find almost anything imaginable that we could want online, pay for it, and have it shipped right to our doorstep without ever having to leave the privacy of our homes! It’s amazing and extremely convenient, but you need to stay steadfast to a major rule for safe online shopping to keep your privacy intact. Never shop on public Wi-Fi networks. These networks are open. Not only could there be, but there certainly are, lurkers perusing those open connections just waiting for someone to make a misstep and enter private information in a form or begin shopping online. Shopping on a public network can expose your credit card details, address, and any other personal information you use or access along the way as you’re shopping. Only shop from trusted, password-protected Wi-Fi connections like the one in your home. A great way to keep an eye on where you’re being mentioned or popping up online is to set up browser alerts for your name or the names of your children. This way, you’ll receive a notification any time that your name is used online, which can help you see if there’s anything coming up online about you that also includes private details. A large part of protecting your privacy is knowing what information exists and is living out in the wild on the Internet. If you can find it and harness it, you can tame it or get rid of it much more easily. 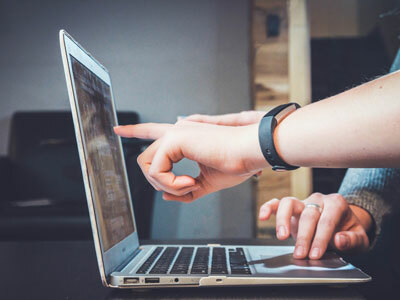 As a general rule, you should never share your account passwords with anyone, but if a trusted family member, friend, or a professional colleague needs access to an account of yours for reasons you feel are valid and nonthreatening to your privacy, then you should take special care to never share passwords via online channels. Never share passwords over a public Wi-Fi network, and only share passwords with people you trust. No matter how high your level of trust is, once you’ve shared a password, you can consider it dead. Once your account’s served its purpose (by your permission), go ahead and change your password. You never know when a relationship can turn sour, and it’s best that as few people as possible know the passwords to your sensitive accounts. 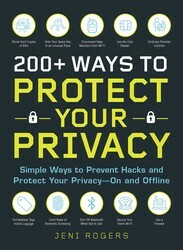 For more tips on keeping your digital privacy a priority check out 200+ WAYS TO PROTECT YOUR PRIVACY by Jeni Rogers! Excerpted from200+ WAYS TO PROTECT YOUR PRIVACY by Jeni Rogers. Copyright © 2019 by author. Used by permission of the publisher. All rights reserved. Discover simple strategies for protecting your personal and confidential information on and offline with this essential and easy-to-understand guide. We all know that the internet can serve as a hotbed for identity theft. But it isn’t the only place where your privacy can be breached. In fact, there are lots of ways you can protect your privacy (or diminish it) that have little or nothing to do with access to the internet. Your home, your photos, your trash can, your kids, your favorite restaurant or store—and even you have the ability to unknowingly reveal your private information to everyone from thieves to busybodies.